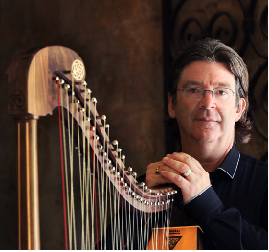 On 5th January 2019, Kamarikuoro Utopia (directed by Andrew Lawrence-King, organ & harp) will present in Helsinki’s German Church the choral music of a Tudor Candlemas, which in private households and secret Catholic ceremonies might have been sung by women and men, rather than by the boys’ choirs of the Anglican rite. Avoiding the now discredited 20th-century musicology that suggested this repertoire should be sung at very high pitch and with the fake solemnity of slow tempi and romantic legato, we recognise and revel in the rhythmic drive of William Byrd’s counterpoint, and share the robust strength of his commitment to the meaning of Latin and English texts, no less dramatic than the plays of his literary contemporary, William Shakespeare. Whilst this glorious polyphony might be heard in our performance as a plausible reconstruction, the interspersed solo songs, poems and instrumental pieces are most definitely not part of the sacred liturgy. Rather they offer a glimpse of the historical context, the inner world of the Tudor mind, full of cultural cross-connections: European cosmopolitanism and English boldness, Catholic complexity and Protestant sincerity, faith and fire, rich poetry and complex polyphony, secret allusions and enigmatic references, luminous joy and hidden melancholy. This (updated) post can be downloaded as a pdf (including illustrations) here. January 5th 2019 is Twelfth Night, the traditional end of Christmas celebrations, and the religious feast of Epiphany, the revelation of Christ to the Three Wise Men. 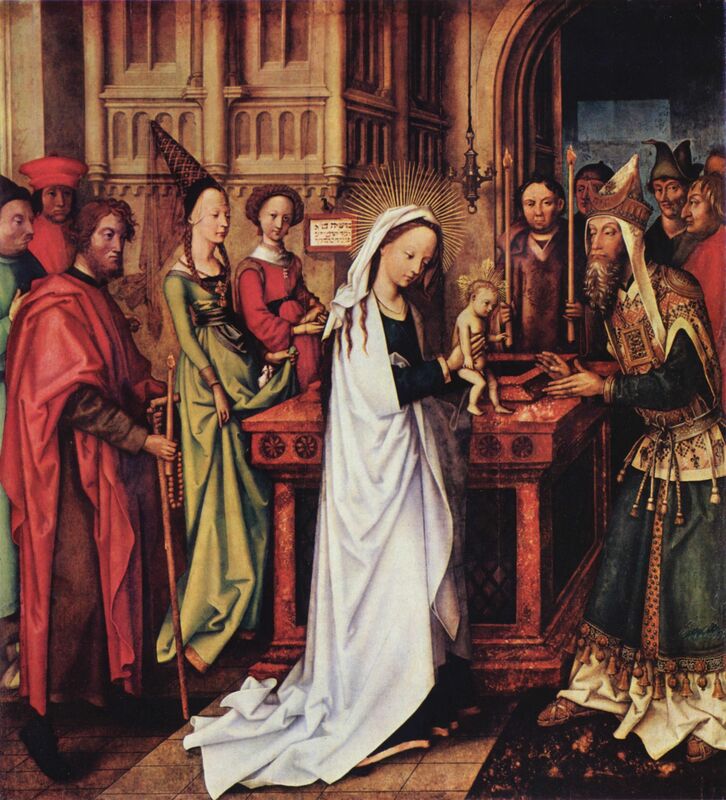 But in Shakespeare’s England, the festive mood continued until the feast of Candlemas (February 2nd), at which the liturgy completes the story of the Nativity with the Purification of the Blessed Virgin Mary and the Presentation of Christ in the Temple. The old man, Simeon, lifts up the Baby and declares him to be “a Light to lighten the Gentiles” – his words became the evening canticle Nunc Dimittis, one of the cornerstones of the Anglican Book of Common Prayer (1662, and still current). The liturgical texts appointed to be sung at Mass on this day, known as the Proper of the Mass, explore many inter-related themes: the sanctity of the church building as a symbol of the holy Temple; the dual nature of the Child, both human and divine; the purity of the Virgin Mary (and by analogy, of Elizabeth I, the Virgin Queen); Simeon’s peaceful departure in old age; the faithfulness of God’s promises, ‘according to Thy word’; the spreading of light through the building (and by analogy the lengthening days of Spring) as a symbol for the spreading of the Gospel. But in the year 1601, English Catholics had to celebrate Candlemas in secret. Services in Latin were forbidden, Catholic Priests would be captured and killed. Father John Gerard, a Jesuit secret agent in England, had set up a safe house for Catholics in London, managed by Anne Line, a widow and ‘a woman of much prudence and good sense’. There, as Father Francis Page was about to begin the ceremony of Blessing the Candles, the watchmen arrived and arrested Anne. She and two priests were hanged the next day; Father Francis was executed a year later. All four martyrs were later canonised as Saints. 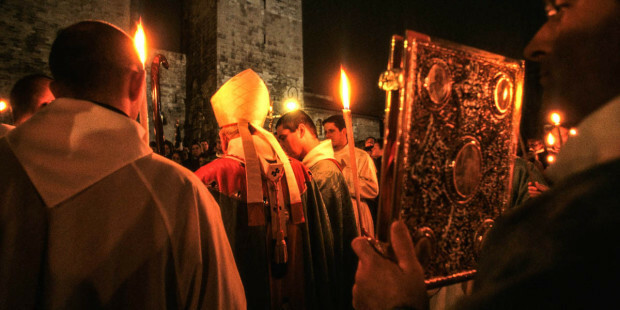 In such difficult and dangerous times, certain elements of the liturgy took on new significance. Worship of Mary was discouraged by Protestantism and became an identifying feature of Catholic piety and Catholic religious music. The Christmas Child, vulnerable amidst Herod’s slaughter of the Holy Innocents, symbolised the precarious situation of the Catholic faith in Protestant England. Catholics hoped that they, like Simeon, would see the glory of salvation – i.e. a return to State Catholicism – before they died, and that the Light of their true faith would enlighten the ‘Gentiles’ – i.e. the Protestants. 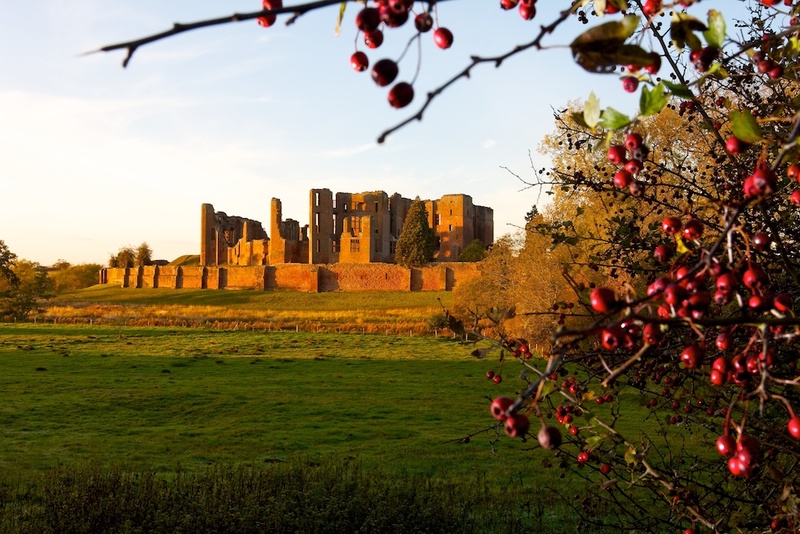 Some Catholics – notably the musicians Byrd and Tallis – were protected by Elizabeth. Others, such as singer, lutenist and composer John Dowland, were discriminated against and chose to emigrate. 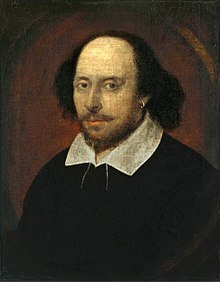 Many were forced to keep their sympathy secret: William Shakespeare might have been one such. 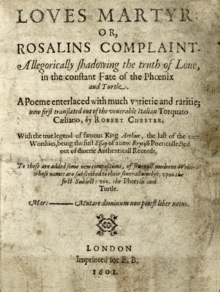 Shakespeare’s enigmatic (1601) poem of mystical love between the legendary Phoenix (a fire-bird reborn from its own ashes) and the faithful Turtledove (symbol of love) remains a subject of academic debate. 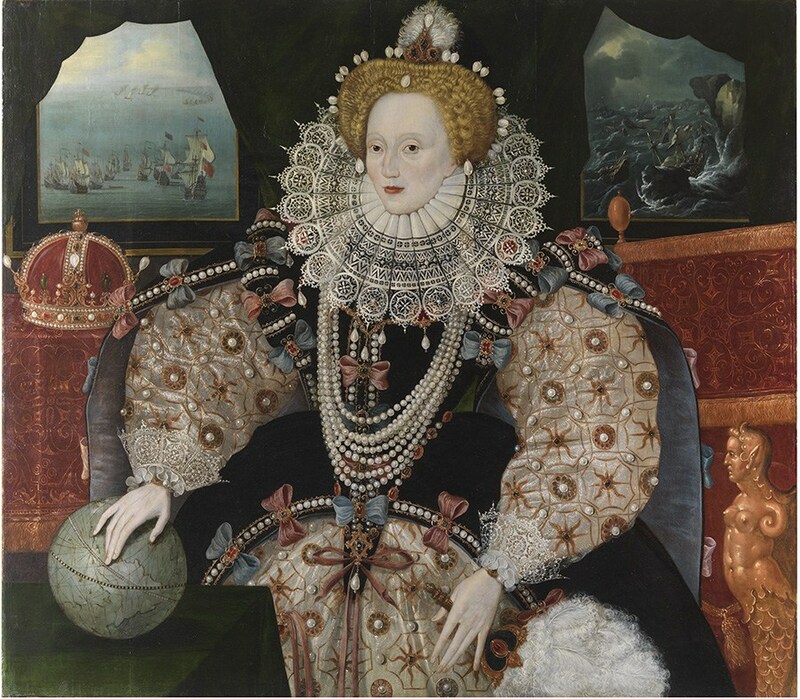 Perhaps it continues the Catholic mystic tradition of the Soul’s spiritual love for Christ, but one theory is that it celebrates the secret love between Queen Elizabeth I and Robert Devereux, the Earl of Essex. 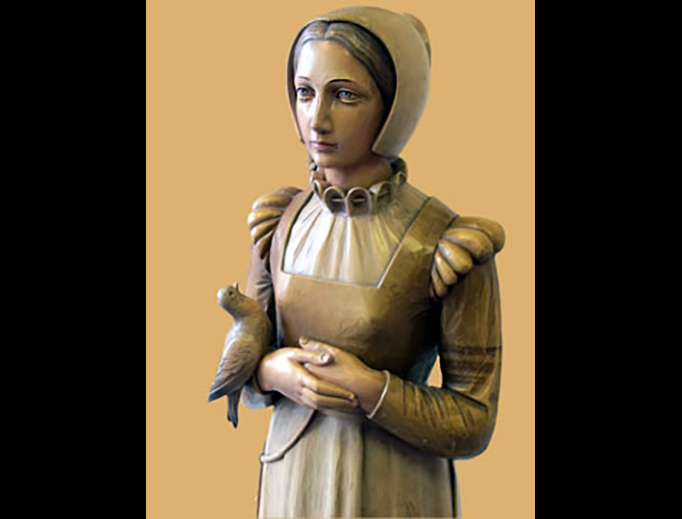 Another interpretation is that it commemorates the Candlemas martyrs, referring to Anne Line’s love for her late husband Roger. 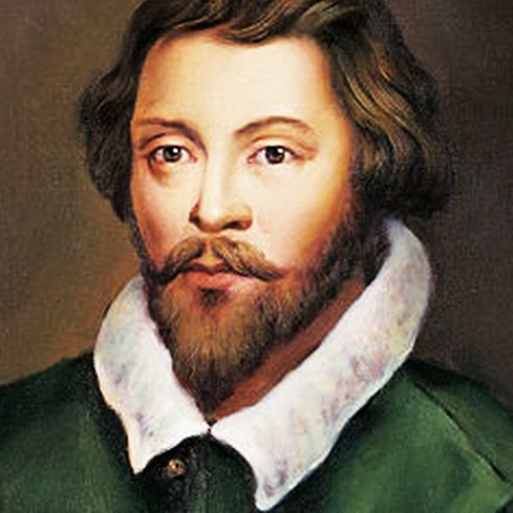 In this pro-Catholic reading, the poem’s opening line ‘Let the bird of loudest lay’ alludes to England’s most famous Catholic composer, William Byrd. There is a useful introduction to the poem here. In 1575 Elizabeth I granted Byrd and Thomas Tallis a monopoly to ‘set songe or songes in parts’, and, as life-long Catholics, their first publication was a set of Latin motets. Byrd’s three settings of the Latin Ordinary (the fixed texts sung at every Mass) in three, four and five parts, together with his Gradualia (settings of the Propers for each religious feast) provided Catholics in Elizabethan England with all the music needed for the complete liturgical year. The Masses have long been recognised as some of the finest examples of Tudor polyphony, and are widely performed today, both liturgically and in concert. For many listeners, the sound of this repertoire is inescapably associated with English Cathedral and College choirs, i.e. with boys’ voices, slow tempi, legato phrasing, highly resonant acoustics, transposition a third upwards, and modern conducting. Many concert ensembles have emerged from this milieu, replacing boys with female sopranos, but (with few exceptions) preserving all the trappings of 20th-century style, in particular that gross anachronism in Early Music, the conductor! The Latin music heard in our performance was edited by David Fraser here. Modern scholarship recognises that Byrd’s Masses and Propers, written in a remote Catholic enclave at Stondon Massey in Essex, are far removed from the Anglican establishment’s boys’ choirs. The composer writes short phrases articulated by the words, and the small parish church of St Peter and Paul has modest acoustics. Historical information has exploded the myth of high pitch for Tudor music, and the latest scholarship confirms that the rhythmic notation of renaissance music indicates the composer’s intended tempo, controlled not by a modern conductor but by the steady measure of Tactus and the lively dance of triple-time Proportions. 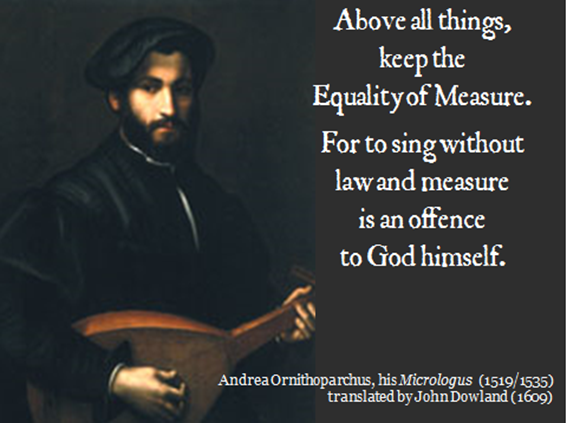 “Above all things, keep the Equality of Measure; for to sing without law and measure is an offence to God himself.” proclaimed John Dowland in 1609. 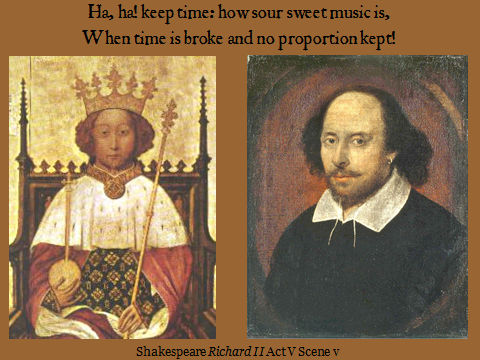 “Keep Time!”, thunders Shakespeare’s King Richard: “How sour sweet music is, when time is broke and no proportion kept”. The dramatic passion of Byrd’s music comes not from romantic rubato, but from the powerful drive of Tactus and detailed attention to the words. In Byrd’s Mass for Five Voices, the first Kyrie begins with the voices imitating each other’s circling melody, an opening that will be heard again as the ‘head-motive’ of the Gloria, Credo and Agnus. Soon, the Christe introduces a characteristic element of Byrd’s counterpoint, syncopated entries that add either rhythmic energy, or (as here) emotional poignancy. In the second Kyrie, tenor and soprano chant the text on monotones, amidst melancholy descending phrases. In the Gloria, as throughout his oeuvre, Byrd is careful to clarify the structure and meaning of the text: an angel choir of high voices prays for ‘peace on earth’, all the singers ‘praise thee’ and ‘give thanks for thy great glory’. Various smaller ensembles (‘Verses’ in the English tradition) pray for ‘mercy’, there are of course high notes for ‘most high’, and attention to the details of dogma in careful enumeration of the three Persons of the Trinity. Byrd’s Credo is a masterpiece of concise story-telling worthy of any Elizabethan madrigalist, combined with all the pathos and solemnity that the liturgical text demands. Clouds of syncopations make the Tactus almost ‘invisible’, but the name of Jesus Christ shines clearly. Two voices represent two Persons, ‘God of God’; a shift to sharps spreads the Candlemas ‘light of light’; Byrd’s sudden change to long notes produces the effect of slower tempo within the constant Tactus for the Incarnatus, and the Crucifixus finds pathos in the Eb and Bb of the ‘soft hexachord’. Et ascendit ascends, and the cadences of non erit finis seem to last forever, until a trio represents the third Person at Et in Spiritum Sanctum. The word secundum (‘according to’, or ‘following’) which occurs frequently at Candlemas is an invitation to the composer to write imitative polyphony, where one voices ‘follows’ another. Such literal reflection of the words in music, heard in the gestures of Byrd’s ‘madrigalism’ and ‘word-painting’, is an audible expression of the renassaince concept of Enargeia: the emotional effect of detailed verbal description. The Sanctus begins with a new point of imitation in three long notes; in the Verse, melodic gestures point upwards and then downwards for caeli et terra, ‘heaven and earth’: of course ‘Hosanna in the Highest’ has high notes for all voices. The Benedictus Verse, ‘Blessed is he that cometh in the name of the Lord’ might be heard as a homage to those Catholic priests who made the dangerous journey from the continent to celebrate Mass in England. The three-fold structure of the Agnus is beautifully observed. Byrd begins in trio with the head-motive and descending phrases for ‘miserere’. The second Agnus is in four parts, with an arch-shape melody for the ‘misere’. The third Agnus opens in full five-part harmonies, with extended melismata on pacem, ‘give us peace;’ a heartfelt prayer for English Catholics. The immense collection of motets in the Gradualia is perhaps Byrd’s greatest achievement. For practicality, texts that recur at different times in the liturgy are set only once, so that (as with a plainchant Missal) singers turn back and forth within the collection to find the music required at each moment. So when the liturgy for Candlemas calls for the introductory words Suscepimus Deus to be sung twice, leading to different verses each time, the partial repeat of the opening motives creates for the listener the effect of musical structure in the Propers, in parallel to the head-motives of the Ordinary. In strict liturgical use, some verses required at other feasts would be omitted at Candlemas. But in order to appreciate Byrd’s music to the full, we have indulged in the luxury of singing all the verses, in particular the gloriously extended praise of the Virgin in the extra verses of Diffusa est gratia. Similarly, the Tract would not normally be sung when Candlemas falls before Septuagesima (as it does this year), but Byrd’s extraordinary setting of ‘Lumen’, the ‘light to lighten the Gentiles’, is too beautiful to be missed. Both Byrd and Tallis also wrote anthems and canticles on English texts for the Anglican church, and in either language, their settings show the poignancy of certain words in the context of religiously-divided Tudor England: Byrd’s significant pause between unam sanctam catholicam and apostolicam ecclesiam [one holy, catholic… and apostolic church]; Tallis’ descending scales, bringing ‘the Spirit of Truth’ down from heaven. Byrd’s prayer that his patroness, Queen Elizabeth be given ‘a long life, even for ever and ever’ is repeated passionately and at length. Just as on the bare boards of Shakespeare’s Globe Theatre, Byrd’s Catholic music creates powerful drama with minimal resources. In contrast, his Great Service for the Anglican rite exploits the opulent resources of the largest Tudor cathedral choirs, divided into two 5-part ensembles on the Dean’s (decani) and Cantor’s (cantoris) sides of the Chancel. The singers combine and re-combine in a variety of ‘Verse’ scorings, contrasting with the imposing ‘Full’ sound of Byrd’s sonorous 5-part writing. There is a helpful introduction to George Peele’s poem for Sir Henry Lee, retiring from public life at the Elizabethan court here. John Dowland set the poem as a lute-song.